According to the team, the potential of the Vietnamese economy remains extensive, with new opportunities emerging. With suitable solutions to optimize the chances and better tap the potential, growth momentum can be sustained in the next two years. They presented three growth scenarios, which project average annual growth rates for 2018 – 2020, at 6.86 percent, 6.91 percent, and 7.06 percent, respectively. The advisors said in 2019, the economy could grow 6.9 – 7 percent, with inflation rate kept under 4 percent. Towards those goals, they said the processing-manufacturing and services sectors must achieve a higher growth than in 2018 and must be considered the two main drivers of the economy. More drastic measures are also needed to promote the development of the private sector. They calculated that private sector investment must account for 15 percent of the GDP in order to achieve the 2019 growth target, adding that the sector boasts untapped potential and the Government should focus more on fostering its development. The team recommended the Government give priority to the implementation of policies and measures designed to address four main bottlenecks – which are the implementation of big-scale projects, breakthrough of the private sector, investment into agriculture, and mobilization of social resources. Pressure should be put on ministries, sectors, and localities in the implementation of the tasks they have been assigned with, they said, adding that a set of standards to assess their performances should be built and regularly monitored by a Government working group. Looking at significant changes ahead, the experts said it is possible to achieve both high growth and macroeconomic stability. 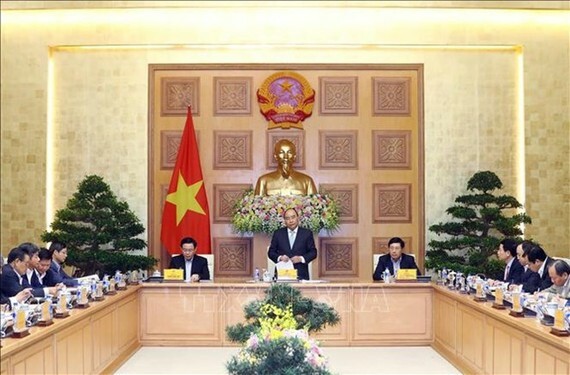 Taking into account the recommendations, PM Phuc agreed with their proposal on the application of the 5G technology and assigned the Ministry of Information and Communications to work on the task. He asked the advisory team to work with Singapore in building an innovation centre following the Singaporean model. The PM directed the Ministry of Planning and Investment to select suitable recommendations to be included in drafts of the Government’s Resolution No 1 on management measures for 2019 and Resolution No 2 on competiveness improvement. The Government leader lauded the team’s collaboration with relevant agencies to research an economic growth model for 2021 – 2030. He asked the experts to give feedback on the draft strategy on socio-economic development for 2021 – 2030 and the socio-economic development plan for 2021 – 2025. He requested the advisors to gather more scientists and economic experts to make recommendations to the Government and himself during the preparation of documents for the Party’s 13th congress. Underscoring his willingness to listen to advises, the PM suggested the group continue monitoring the Government’s policies and collaborating with ministers, sectors and businesses for prompt proposals.